The Albert County Museum was bustling with activity on Wednesday, May 10 as Anglophone East students came to spend the day participating in the 2017 Regional Heritage Fair. Students from five middle schools proudly displayed their creative and innovative heritage projects of varied themes and project categories in the Community Hall. Judges interviewed the students and assessed the projects based on specific evaluation criteria for the special juried awards, as well as other prizes. But, the day included much more than the judging! Enrichment activities included each student “Painting a Mosaic Tile”. This activity is part of a Canada 150 project which will result in a large mosaic being created by a professional artist using the painted tiles from all the Regional Heritage Fairs throughout the school districts in the province. The finished provincial mosaic will then be displayed at Government House in Fredericton. In the historic Courthouse built in 1904, the students also enjoyed the presentation of historical vignettes by the summer students from the William Henry Steeves House Museum in Hillsborough. The costumed actors portrayed the inhabitants of the Albert County region of Canada, beginning with the Aboriginal Mi'kmaq, then the Acadians, followed by the German immigrants of the Stief family, and English loyalists. The last vignette portrayed the celebration of Dominion Day, July 1, 1867. This year the RHF students were present for the special ceremonial planting of a Vimy oak tree presented to the Museum by the Vimy Foundation. The students learned of the significance of the Vimy oak tree being planted at the Albert County Museum. At the Museum is a WWI German K-14 cannon captured by a Canadian Battalion at the Battle of Vimy Ridge on April 9, 1917. The German cannon, a war trophy of Canada, was awarded to Albert County for winning the Victory Loan campaign of 1919. Following the planting of the Vimy oak tree, the Awards Ceremony took place in the Courthouse. The following students were recipients of the Regional Heritage Juried Awards and other prizes. Naiya Istvanffy, grade 5 student from Dorchester Consolidated School, received the Provincial Showcase Award. 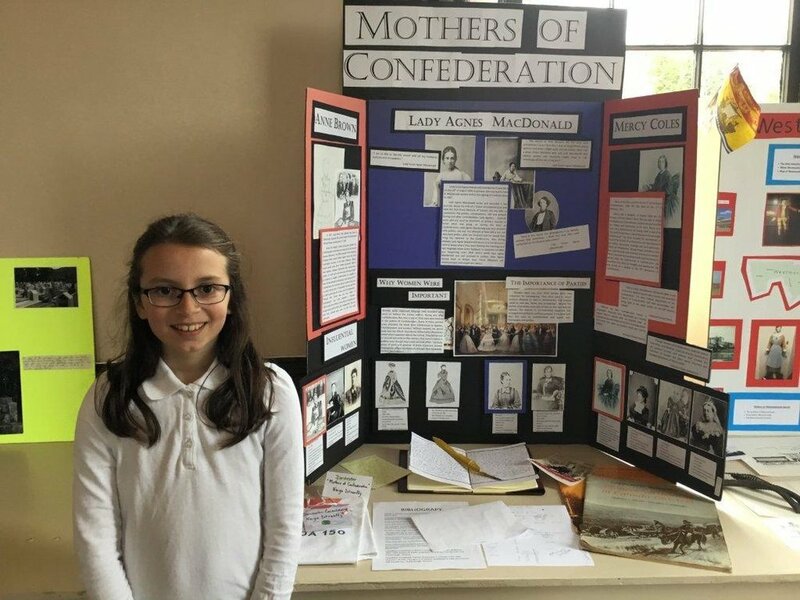 Naiya was selected to represent ASD-E with her project “The Mothers of Confederation” at the Provincial Heritage Fair to be held June 23-25 at the Albert County Museum, Hopewell Cape, NB. Naiya Istvanffy also received the Young Citizen's Award so she will be creating a 2-3 minute video about her project to be submitted to the History Society of Canada website. Dominick Fournier (Dorchester Consolidated) received the NB Historic Places Award for his project “The History of Westmorland”. Kassi Stuart (Riverview East) received the NB St. Croix Award for her project “Blockhouses and Forts of New Brunswick”. Cadence Nelson (Dorchester Consolidated) received the NB Aboriginal Affairs Award for her project about The Maliseet Tribe and First Nations”. Sarah MacAulay (Evergreen Park) received the Council of NB Archives Award for her project “Le Pont de la Confédération”. Jake Purdy and Elliot Hicks (Dorchester Consolidated) received the NB Sport Legacy Award for their project on “Lacrosse”. Sally Kim (Riverview East) received the NB Labour History Award for her project “Ganong”. Lexa Kwan (Evergreen Park) was awarded the Canada's History medal for her project “Les événéments et les personnes qui ont mené a la création du drapeau Canadien”. Liam Haynes (Evergreen Park) received the NB Military History Award for his project “Speech About the Battle of Vimy Ridge”. Three Royal Canadian Legion Military History Medals were awarded to Natalie Thompson, Caylin Carson and Haley Batson from Port Elgin Regional for their project “The War of 1812”. The Albert County Museum prizes were awarded to Molly Dixon (Port Elgin Regional) for project “Vimy Ridge”and to Landon Stevens, Ben Bouchard, Ryan Milburn and Alexander MacFarlane (Caledonia Regional) for “Sugar Woods” project. Special prizes from Fort Beausejour-Fort Cumberland were awarded to Joris Jakob and Aiden Sweeney (Port Elgin) for their project “Acadian Farming”. Honorable mention prizes were awarded to Robbie Harker and Hunter Pepper (Port Elgin) for project “The Confederation Bridge”; to Breeze Tingley and Hailey Tingley (Caledonia Regional) for project “Gray's Island” and to Olivia NcGrath (Caledonia Regional) for project “Multiculturalism”. If you haven't heard the Riverside Consolidated School could be closed as early as June, 2015. Here is a link for further news and who you can write to in support of the school. Construction of the Riverside Consolidated School began in July of 1904. Designed by architect, W. E. Reid, who was the youngest of three sons who all followed the same profession. He was born in Harvey, New Brunswick to William J. Reid and Lucinda Robinson. He studied at Mount Allison University and about 1888, he joined his brothers James W. and Merritt in California, where he ran their San Diego office, overseeing construction of the massive Hotel del Coronado to his brother's designs. He returned to Canada in 1899 and had a few commissions there under the auspices of Senator Abner Reid McClelan. These included the Riverside Consolidated School and the Albert County Court House. The construction was partially funded by a $5000 donation from Riverside resident and former Lieutenant-Governor of New Brunswick, Abner Reid McClelan, with the stipulation that manual training, household science, and nature work classes were to be provided, in addition to the more traditional subjects. The province paid $1,000 and the remaining $14,000 was paid by local taxpayers. Riverside Consolidated opened in September of 1905, 225 students filed through the doors and experienced the most modern facilities available at the time. The school had five departments and staff of seven teachers. The Albert County Grammar school was one department, enabling students to prepare for University Matriculation. The other departments included Household or Domestic Science, manual Training, Agriculture and school Gardening. The new school was staffed by seven teachers and a janitor. Students were brought by horse-drawn van from surrounding communities like Chester, Beaver Brook, Midway, Harvey, and Hopewell Hill during the spring and fall and by horse-drawn sleigh during the winter. The formal opening ceremony took place June 15, 1906. New Brunswick Premier Tweedie, Chief Superintendent of Education, J.R. Inch and many other officials arrived by way of the steamer “Wilfred C.” at the Riverside Wharf. There they were met by Honourable A.R. McClelan and the drum and bugle of Albert performed. Premier Tweedie as well as many other dignitaries were all quite impressed with the new facility, declaring it a model for other educational facilities across the Province. Today after 100+ years of operation, the Riverside Consolidated School is the oldest operating consolidated school in New Brunswick. Children from communities as far away as Lower Cape and Alma, attend the school from kindergarten to grade five.